Cozumel is known for adventure, nature, water activities, beaches, and theme parks. Your plan includes some of its best attractions: take a tour by water with Boat Tours & Water Sports, get out on two wheels at EagleRider Cozumel, see the vivid underwater world at Palancar Reef, and tour the pleasant surroundings at Playa Palancar. To see more things to do, where to stay, and tourist information, you can read our Cozumel vacation planner. Toronto, Canada to Cozumel is an approximately 11.5-hour flight. Traveling from Toronto in November, things will get warmer in Cozumel: highs are around 30°C and lows about 22°C. Finish up your sightseeing early on the 9th (Thu) so you can travel to Cancun. You'll find plenty of places to visit near Cancun: Playa del Carmen (Scuba & Snorkeling, Quinta Avenida, & more). Spend the 9th (Thu) in unforgettable company with a swim-with-the-dolphins experience. There's much more to do: buy something for everyone on your list at La Isla Shopping Village, kick back and relax at Playa Tortugas, take advantage of the amenities at Mandala Beach, and stop by Plaza Las Americas. To find other places to visit, traveler tips, where to stay, and more tourist information, read Cancun travel itinerary planner. Fly from Cozumel to Cancun in 2.5 hours. Alternatively, you can do a combination of ferry and bus. In November, plan for daily highs up to 32°C, and evening lows to 24°C. Cap off your sightseeing on the 14th (Tue) early enough to go by car to Tulum. Step out of Tulum to go to Coba and see Cobá Zona Arqueológica Cobá, which is approximately 1h 15 min away. Pack the 15th (Wed) with family-friendly diversions at Xel-Ha. Spend the 19th (Sun) among aquatic life with a scuba or snorkeling tour. There's much more to do: steep yourself in history at Ruinas Mayas de Tulum, tour the pleasant surroundings at Playa Paraiso, look for all kinds of wild species at Punta Laguna Nature Reserve, and explore the fascinating underground world of Grand Cenote. To see more things to do, traveler tips, and other tourist information, read Tulum trip itinerary builder. Traveling by car from Cancun to Tulum takes 2 hours. Alternatively, you can take a bus; or take a shuttle. November in Tulum sees daily highs of 30°C and lows of 22°C at night. Wrap up your sightseeing on the 22nd (Wed) to allow time to drive to Valladolid. You'll find plenty of places to visit near Valladolid: Chichen Itza (El Castillo, Chichen Itza, & more) and Ek Balam Mayan Ruins (in Temozon). There's still lots to do: get interesting insight from Xkeken Tourstation & Jungle Park, explore the world behind art at Casa de los Venados, delve into the distant past at Ek Balam, and take in the architecture and atmosphere at Catedral de San Servasio. To see maps, other places to visit, and more tourist information, go to the Valladolid custom trip planner. Traveling by car from Tulum to Valladolid takes 1.5 hours. Alternatively, you can take a shuttle; or take a bus. Traveling from Tulum in November, expect somewhat warmer with lows of 28°C in Valladolid. Finish your sightseeing early on the 25th (Sat) so you can drive to Merida. You'll find plenty of places to visit near Merida: Temples of Uxmal (in Uxmal) and Uxmal (in Muna). There's still lots to do: don't miss a visit to Ruta Puuc, delve into the distant past at Zona Arqueologica Uxmal, steep yourself in history at Mayapan Mayan Ruins, and admire the striking features of Paseo de Montejo. To find maps, reviews, other places to visit, and tourist information, refer to the Merida holiday planner. Traveling by car from Valladolid to Merida takes 2 hours. Alternatively, you can take a shuttle; or take a bus. Traveling from Valladolid in November, plan for little chillier nights in Merida, with lows around 23°C. 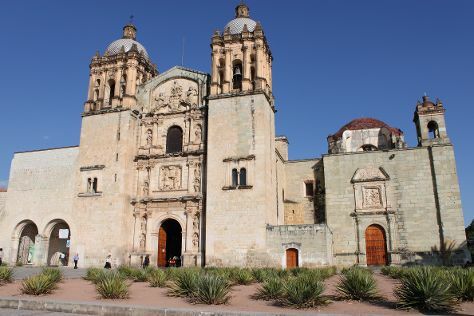 Wrap up your sightseeing by early afternoon on the 28th (Tue) to allow time for travel to Oaxaca. On the 29th (Wed), steep yourself in history at Monte Alban, then admire the striking features of Basilica de la Soledad, then take in the spiritual surroundings of Templo de Santo Domingo de Guzman, and finally take in the spiritual surroundings of Cathedral of Oaxaca. Get ready for a full day of sightseeing on the next day: get the lay of the land with Walking tours. For other places to visit, where to stay, more things to do, and more tourist information, go to the Oaxaca trip builder. Traveling by flight from Merida to Oaxaca takes 5 hours. Alternatively, you can drive; or do a combination of bus and flight. The time zone changes from Eastern Standard Time to Central Standard Time, which is usually a -1 hour difference. Traveling from Merida in November, expect Oaxaca to be slightly colder, temps between 32°C and 13°C. On the 30th (Thu), wrap the sightseeing up by early afternoon so you can travel to Mazatlan. Mazatlan is known for historic sites, sightseeing, nature, beaches, and zoos & aquariums. Your plan includes some of its best attractions: enjoy the sand and surf at Playa Olas Altas, step off the mainland to explore Stone Island (Isla de las Piedras), make a trip to Malecon, and tour the pleasant surroundings at Playa Las Gaviotas. 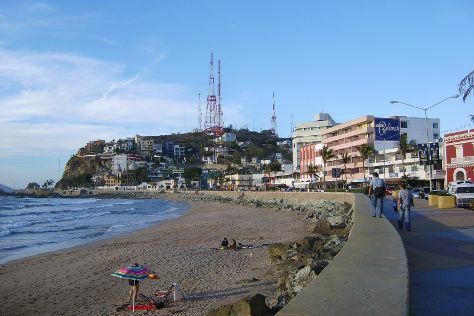 To see reviews, other places to visit, and other tourist information, read Mazatlan itinerary maker. You can fly from Oaxaca to Mazatlan in 5 hours. Other options are to drive; or take a bus. The time zone changes from Central Standard Time to Mountain Standard Time, which is usually a -1 hour difference. Plan for somewhat warmer nights when traveling from Oaxaca in November since evenings lows in Mazatlan dip to 20°C. Finish your sightseeing early on the 4th (Mon) so you can travel to Puebla. Start off your visit on the 4th (Mon): see the interesting displays at Amparo Museum (Museo Amparo) and then get in on the family fun at Estrella de Puebla. Get ready for a full day of sightseeing on the 5th (Tue): browse the collection at Biblioteca Palafoxiana, then take in the spiritual surroundings of Rosary Chapel (Capilla del Rosario), then contemplate in the serene atmosphere at Church of Santo Domingo (Iglesia de Santo Domingo), and finally make a trip to Murals of the Government Palace. For photos and more tourist information, go to the Puebla travel planner. You can do a combination of flight and bus from Mazatlan to Puebla in 4.5 hours. Alternatively, you can drive; or take a bus. Traveling from Mazatlan to Puebla, you'll lose 1 hour due to the time zone difference. Expect slightly colder temperatures when traveling from Mazatlan in December; daily highs in Puebla reach 26°C and lows reach 7°C. Finish your sightseeing early on the 7th (Thu) to allow enough time to drive to Mexico City. Venture out of the city with trips to San Juan Teotihuacan (Pyramid of the Sun & Zona Arqueologica Teotihuacan). There's still lots to do: see the interesting displays at National Museum of Anthropology (Museo Nacional de Antropologia), make a trip to Zocalo, steep yourself in history at Chapultepec Castle, and explore the world behind art at Palacio de Bellas Artes. To see reviews, other places to visit, where to stay, and tourist information, use the Mexico City trip builder. Traveling by car from Puebla to Mexico City takes 1.5 hours. Alternatively, you can take a bus; or take a shuttle. December in Mexico City sees daily highs of 26°C and lows of 9°C at night. Wrap up your sightseeing by early afternoon on the 12th (Tue) to allow time for the car ride to San Miguel de Allende. 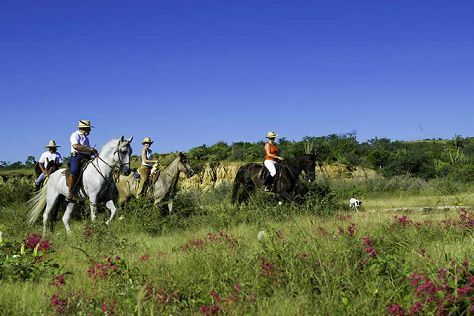 Saddle up on the 15th (Fri) and explore with a tour on horseback. The adventure continues: stroll through El Charco del Ingenio, look for gifts at Abrazos San Miguel, contemplate in the serene atmosphere at Parroquia de San Miguel Arcangel, and identify plant and animal life at Canada de la Virgen. For traveler tips, more things to do, maps, and other tourist information, you can read our San Miguel de Allende trip planner. You can drive from Mexico City to San Miguel de Allende in 3.5 hours. Alternatively, you can do a combination of flight, taxi, and bus; or take a bus. In December in San Miguel de Allende, expect temperatures between 28°C during the day and 9°C at night. Finish your sightseeing early on the 17th (Sun) so you can travel to Puerto Vallarta. Step out of Puerto Vallarta to go to Cabo Corrientes and see Vallarta Botanical Gardens, which is approximately 1 hour away. There's lots more to do: take a leisurely stroll along Puerto Vallarta's El Malecon Boardwalk, take in the spiritual surroundings of The Church of Our Lady of Guadalupe, enjoy the sand and surf at Bucerias, and relax and rejuvenate at some of the top local wellness centers. To see where to stay, photos, reviews, and more tourist information, read our Puerto Vallarta itinerary maker. Getting from San Miguel de Allende to Puerto Vallarta by combination of bus, taxi, and flight takes about 5 hours. Other options: drive; or take a bus. Expect a bit warmer temperatures when traveling from San Miguel de Allende in December; daily highs in Puerto Vallarta reach 32°C and lows reach 21°C. Wrap up your sightseeing by early afternoon on the 22nd (Fri) to allow enough time to travel to Cabo San Lucas. Step out of Cabo San Lucas with an excursion to Playa Palmilla (Palmilla Beach) in San Jose del Cabo--about 32 minutes away. The adventure continues: explore the striking landscape at El Arco de Cabo San Lucas (Lands End), stroll through Cuadra San Francisco, fulfill a lifelong dream with a swim-with-the-dolphins experience, and take in the waterfront activity at Medano Beach. To see maps, where to stay, ratings, and other tourist information, go to the Cabo San Lucas vacation trip planner. Traveling by combination of flight and bus from Puerto Vallarta to Cabo San Lucas takes 7 hours. Alternatively, you can drive. Due to the time zone difference, you'll gain 1 hour traveling from Puerto Vallarta to Cabo San Lucas. Expect slightly colder weather when traveling from Puerto Vallarta in December: highs in Cabo San Lucas hover around 29°C, while lows dip to 21°C. Cap off your sightseeing on the 29th (Fri) early enough to travel back home.